A hidden hexagram is embedded within the Pyramid symbol. The Eye of Horus (Eye of Satan) forms the top part of the first triangle and the sides of the pyramid form the sides of the triangle. 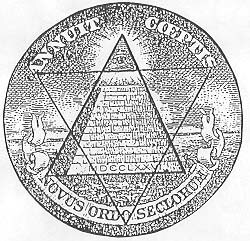 The second triangle has another "eye" within it, formed by the "O" of Novus Ordo Seclorum. The "A" of Annuit and the "S" of Coeptis form the outer points of the second triangle. ("Secrets of the Illuminati" by Doc Marquis). Hidden symbols are extremely important to the occultist. A hidden symbol becomes a "Magical Symbol" capable of great power. As explained in the book , "Magic Symbols" , "The true magic symbol is an image which hides an inner meaning". In other words, power is generated when the uninitiated cannot grasp the hidden symbolic meaning. Occultists have believed for centuries that their very secrecy gives them immense power. However, this hexagram is surrounded by a circle, making it a demon trap. Thus, a witch can use it to conjure up a demon to work on behalf of the United States of America to achieve the New World Order.